I finally found the perfect bread machine cinnamon roll recipe. I messed around with a couple of different recipes to come up with this one. This is not allergy free for my 7 year old, but it doesn't have soy or barley, so he had one, even though it has eggs and milk. I need to try tweaking this recipe to make it allergy free for him and see if it works out. Anyway, here is the recipe! They were SO GOOD! Not healthy, at all, but a tasty indulgence! The picture is deceiving... These are pretty big! I honestly don't measure the cinnamon and sugar, I just sprinkle it until it looks good to me. Adjust milk if it's too thick to fully mix well. Put the dough ingredients in the bread machine in the order that they are listed above and run on the dough cycle. After the dough is finished, roll it out into a large rectangle. 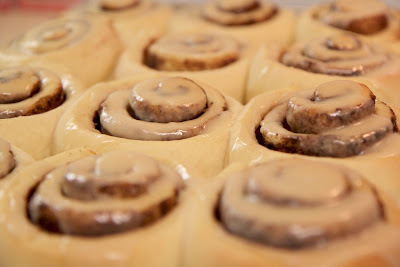 Spread the melted butter over the rolled out dough and sprinkle the cinnamon and sugar evenly over it. Roll the dough and cut into roughly 1 1/2 inch sections. I get 12 out of this. Butter and lightly sprinkle sugar on a baking sheet. Place cut cinnamon rolls onto the baking sheet, close together. Bake at 325 for about 22 minutes (remember that ovens vary. So watch them and take them out when they begin to get a light golden brown.) Spread the icing on as soon as they come out of the oven.